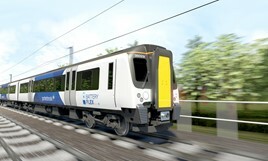 Porterbrook is considering converting AC-powered Class 350/2 Desiros so that they can be powered by batteries. The rolling stock leasing company owns 37 four-car sets (dating from 2008-09) that are due to be sent off-lease by West Midlands Trains following the delivery of newer electric multiple units. It says the trains are Britain’s most reliable, recording 100,420 Miles per Technical Incident. Branded the BatteryFLEX, the ‘350/2s’ would be able to match or outperform diesel trains on existing non-electrified routes - particularly in key corridors across the north of England, according to their owner. “The addition of the BatteryFLEX to our rolling stock portfolio will help train operators further reduce their carbon footprint and emissions, while maintaining performance and delivery,” said Porterbrook CEO Mary Grant. For the FULL story, read RAIL 864, published on October 24, and available digitally from October 20 on Android, iPad and Kindle. If Porterbrook were to convert the Siemens Class 350/2s to be converted as Class 350 IPEMU ( Battery-Electric) trains. I think they could use them in Wales or operate them on the Midland Main Line (when the electrification is completed between Bedford-Kettering & Corby). Or possibly use them on the Crosscountry routes if Crosscountry could inherit some of the IPEMU Class 350/2s. And maybe some of the Class 350/2s to ScotRail to replace the Class 365s. Or will the Class 350/2 be left abandoned and to be sent to storage. As they are to be replaced by the Class 730 Aventras from 2020-onwards that West Midlands Trains have ordered which will also replace the Class 323s. Back in 2015. Bombardier have fitted batteries onto one of Greater Anglia’s Class 379 Electrostar “379013”. And the Class 379 train did a passenger trial run operating between Manningtree and Harwich Town using both AC 25kv Overhead and Battery power. Which only lasted for about a year. As a test run. Which could see Class 379s to become battery-electric trains in the future. The Class 350/2 should remain as they are but to use them on the Midland Main Line once the electrification to Kettering and Corby is completed then the Class 350/2s might be able to operate between London St. Pancras-Kettering and London St. Pancras-Corby under a different franchise or open access franchise. Siemens have already fitted a 500kWh battery to an Austrian Desiro. There appears to be a fair bit of space under one of the trailer cars and given that there are a lot of similar Desiros in the UK, in the guise of 350, 380 and 450 trains, I wonder if this is the breakthrough that battery trains need.